Sometimes that unique image is just down to being in the right place at the right time. 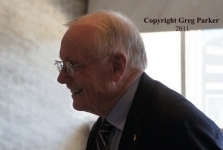 Here is Neil Armstrong at the Starmus Festival on Tenerife in 2011. Having happily put this up as Image of the Month – it was an immense shock to hear of the passing of Neil Armstrong just over 3 weeks later 🙁 The world has lost a great man.